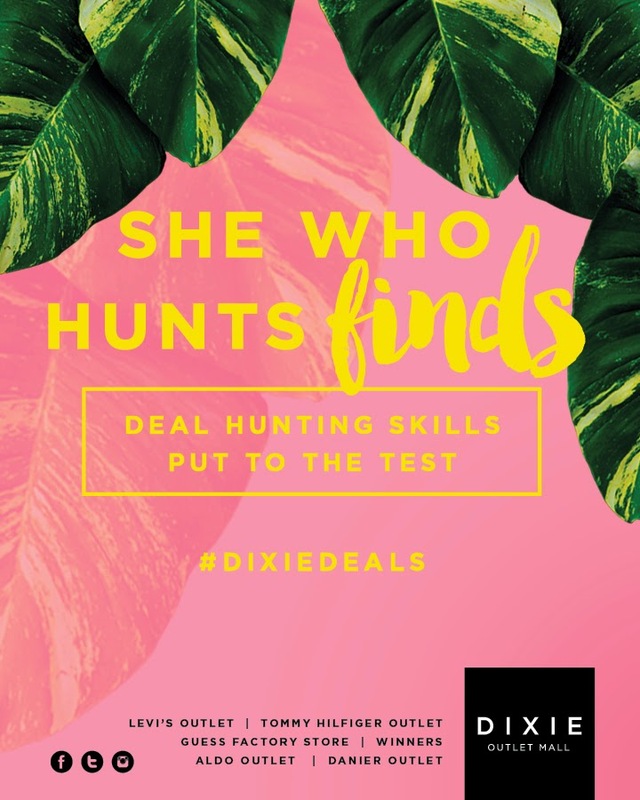 For those of you who have been following along, I recently took on the She Who Hunts Finds Blogger Challenge hosted by Dixie Outlet Mall. The #DixieDeals shopping experience was honestly more fun than I had bargained for. I had no idea what I would find and to be frank, I wasn't even sure what I was looking for. I thought of purchasing a spring dress or too but there were so many, it was hard to narrow it down. Then I thought of selecting an outfit that would be more practical for work by picking out pieces that could be used with my current wardrobe. 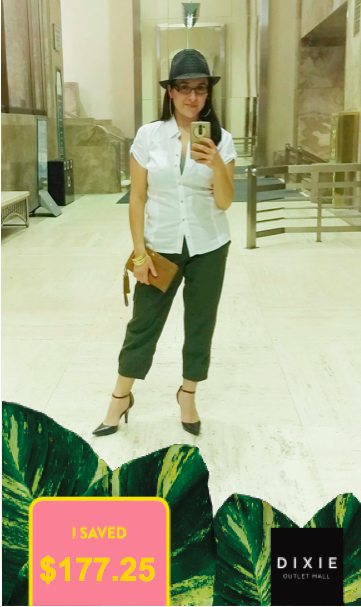 After spending the bulk of my time at Guess, I finally went with a pair of kaki Sue capri pants for $29 and a Mick button-up shirt in white for $39. I picked up of tank tops, one in peach and one in kaki, that I could wear underneath the shirt for $5 a piece at Garage. The gold buttons on the shirt were my inspiration to purchase a mixed set of bangles, a cutoff cuff bracelet and some rhinestone hoop earrings at Urban Planet where they had a buy two, get one promotion. And I found a beautiful leather wallet that I could use as a wristlet on sale at Danier for $49. My favourite find was the pair black leather shoes I nabbed at Nine West for a mere $30! To top off the outfit, I found a cute black straw hat at la Vie en Rose Aqua for $7. All in all, I'm quite pleased with the casual outfit that can easily be dressed up for a night on the town. Or for attending a VIP Big Brother Canada viewing party. When I made my final tally, I think I did a pretty good job finding #DixieDeals, too. In total, I spent $201 on what would have cost me $378! So tell me what do you think of my final outfit? 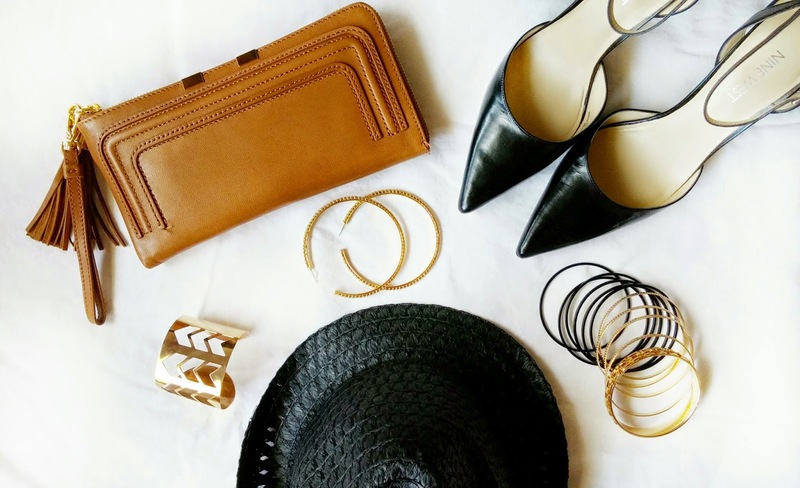 Enter to Win a $200 Dixie Outlet Mall Gift Card! For a chance to win a $200 gift card courtesy of Dixie Outlet Mall, fill out the Rafflecopter form below. Disclosure: I am participating in a DixieDeals blogger challenge and have received special perks as part of this program. Any opinions expressed in this post are my own. I like the outfit. Fresh and crisp. I wish I could wear those shoes, but they do suit you. I would get some new summer clothes to fit my new postpartum body! I would head to Winners and buy an awesome outfit! Some new shoes for the summer. Great outfit!! I'd buy some summer clothes if I won. What would I buy? I need summer dresses and shoes, so that would be my hope! I would buy myself new staples for my work wardrobe! I would treat myself to some clothes... instead of always the kids! If I won I would treat myself to some new clothes -- I need something to wear to a wedding and I need casual stuff too. I have a wedding coming soon, so definitely a new pair of shoes and a purse. I would buy jeans and shirts. I would buy a dressy summer outfit - a blouse and some capris! Your final look is great! If I won, I'd purchase shoes, and an awesome purse! I need to lose weight before finding clothes that look good on me. I would hit up Danier Leather if I won! I have to say your look FAB as always! I'd buy some summer shoes and maybe a dress. I'd frame my daughter's diploma at Michael's. My friend bought a really awesome handbag there and I'm in desperate need on one. I'm using a bag from the dollar store right now. lol. I would buy a pair of shoes! New sandals and tank tops! I would take my 2 daughters to Garage and stock up on summer clothing! I'd buy some summer dresses. I'd start with that hat you're wearing adn the shoes for sure #love. We need new spring & summer clothes. I'd love to get some new spring/summer frocks. I'd buy shoes and more shoes. Out of the whole outfit, I am really loving your fedora!! I would get some new outfits for work, probably capris and fancier tops. I need shoes and something to wear for fun nights out. Nice post.Really enjoyed reading it from start to finish and I am interest for your next post and you have any time Please visit my gym attire page and leave comments. My boys and I were at Dixie Mall this past week with my mom. We just love that mall.